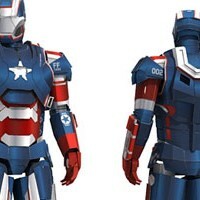 Finally I completed all the Iron Patriot paper model part. This project started on April 2013, it's been 4 months. As I already mentioned before, this is my last Iron Man model template, I had enough with Iron Man. Don't worry Cristiano and Suraj are now preparing for Iron Man Gemini part 1 to be released, so there will still be new Iron Man models around. Also as usual this paper model comes with 2 version of template, colored and blank one. The template consist of 12 pages of patterns. Assembly instructions only cover the right leg part. Now I am preparing for modeling a Jaeger from Pacific Rim movie. The last part of Iron Man Mark 17 or Heartbreaker is already released. The template contains 16 pages of hip and leg parts including its display stand. Cristiano also added 3 pdo files which are part 1 to part 3. Now he is on the process of modeling Iron Man Gemini part 1 and Batman figurine. This model is a 1/6 paper model and pose-able. This project was done by Cristiano Luis Dias (modeling, unfolding) and Suraj S. Prakash (coloring). Cristiano Luis Dias shares with us his latest work on Iron Man Mark 17 Heartbreaker paper model. This template is part 2, contains 5 pages of arms part patterns. Suraj S Prakash did the coloring on this template, he also made a blank template for part 1. 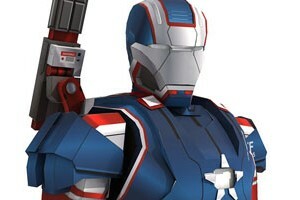 Iron Patriot last part is postponed because I have to finish a commissioned project until the end of the month. Then I will update it before going to a family vacation. This template is the first template I released after more than a month break. The part 2 template contains 4 pages of colored version patterns and 5 pages of blank patterns. When completed you will have both arms with the back laser weapon? Honestly, I haven't watch this Iron Man 3 movie. Since our second child was born, my son Kyan now 10 months, we never got a chance to watch movie in theater. Because we usually go out together, two kids, our maid, my wife and me. Okay back to the template, basically both arms, left and right have the same parts (mirrored) and have the same number, so I suggest to finish one side of arm at one time and then move to build another side. 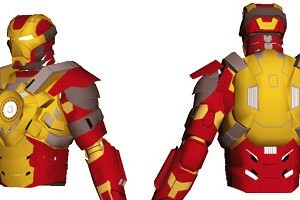 The joints design is similar to previous Iron man model, so for you who have build my previous Iron Man model, shouldn't have a problem. But for you who never build one, perhaps you should check my previous template if you have any problem on the joints. 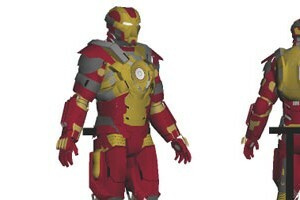 In the movie Iron Man 3, we are introduced to so many new armors, at least 40+ new armors. There are many request to me to make more iron man armors, but I already decided that I will stop on iron patriot, to give chance to other model subjects. But don't worry our friends Cristiano Luis Dias and Suraj S Prakash have new armor on the line. 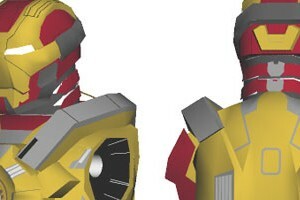 This is the first part of Iron Man Mark 17 "Heartbreaker" paper model template. It contains of 5 pages of patterns, the scale is 1:6.